(AP) CAIRO - Mohammed Morsi of the Muslim Brotherhood was declared the winner Sunday of the first free elections in Egypt's history, making him the successor to ousted President Hosni Mubarak. Here are some key events from 16 months of turmoil and transition. Jan. 25, 2011> - Egyptians hold nationwide demonstrations against the authoritarian rule of Mubarak, who has led the country for three decades, in what would become known as the Arab Spring. Jan. 26 - A large security force moves into Cairo's Tahrir Square, beating and arresting protesters, using rubber bullets and tear gas. 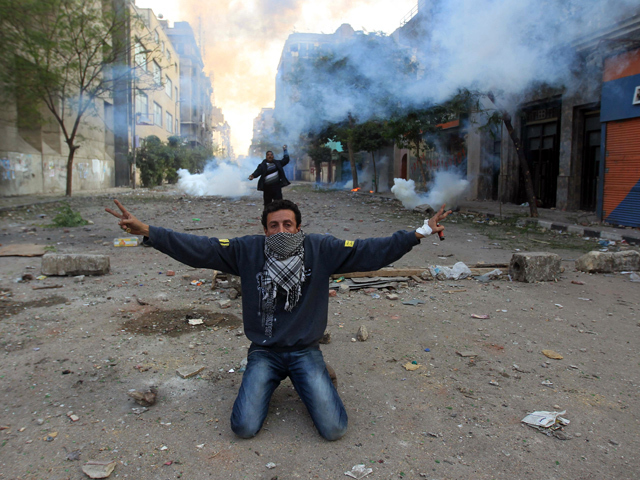 Three protesters are killed - among the first of what will become about 900 dead in clashes in the uprising. Jan. 28 - Amid continuing unrest, protesters burn down the ruling party's headquarters and the military is deployed. Police virtually vanish from Egypt's streets, leading to a wave of looting, robbery and arson. Jan. 29 - Mubarak makes his first public appearance since the protests began, saying he asked his cabinet to resign. The move is met with scorn from protesters. Feb. 1 - Mubarak says he will not run again for president as tens of thousands converge in Cairo, responding to a call for 1 million Egyptians to unite against him. Feb. 2 - Mubarak supporters clash with anti-government protesters. Soldiers stand by without intervening, and more deaths and injuries result. Feb. 10 - Mubarak transfers power to his vice president while retaining his title and promises constitutional changes. The move falls short of protesters' demands. Feb. 11 - Mubarak steps down and turns power over to the military. Two days later, military leaders dissolve parliament and suspend the constitution, meeting two key demands of protesters. April 13 - The prosecutor general announces the detention of Mubarak pending inquiries into accusations of corruption, abuse of authority and the killings of protesters during the uprising. Mubarak's two sons, Gamal and Alaa, also are detained. Aug. 3 - Mubarak goes on trial, appearing in court in a hospital bed, with his two sons beside him. Nov. 28 -Voting begins in Egypt's first parliamentary elections since Mubarak's ouster. The election is staged over a period of several weeks and concludes in January with nearly half the seats won by the previously banned Muslim Brotherhood. April 20, 2012 - The presidential campaign officially begins, with the election commission announcing the candidates running for president. The commission had earlier disqualified 10 presidential hopefuls, including three considered to be potential front-runners. May 23 - The first round of voting for president begins with 13 candidates on the ballot, with Mohammed Morsi of the Muslim Brotherhood and Ahmed Shafiq, the last prime minister under Mubarak, emerging as the top two vote-getters. June 2 - Mubarak is convicted for failing to stop the killing of protesters during the uprising and is sentenced to life in prison, but cleared of corruption charges. June 14 - The Supreme Constitutional Court orders the Islamist-dominated parliament dissolved and rules that Shafiq can stay in the presidential race. The rulings by the Mubarak-era judges escalate the power struggle between the Muslim Brotherhood and the military. June 16-17 - Egyptians vote in a runoff election between Morsi and Shafiq. The military council that has ruled since the uprising issues an interim constitution, giving the generals sweeping authority to maintain their grip on power and limiting the powers of the president. June 18 - Morsi declares victory, but so does Shafiq. June 19 - Thousands of Morsi supporters gather in Tahrir Square to protest the interim charter issued by the military and the dissolution of parliament. June 24 - Election officials declare Morsi the winner of Egypt's first free election with 51.7 percent of the vote, as his supporters celebrate wildly in Tahrir Square.